1965: two of the Pickles brothers, Andrew (10) and Freddie (8), present a cheque for £1,000 to consultant physician Mr Fountain of the Leukaemia Research Fund. The boys' brother, nine-year-old Christopher, had died of leukaemia. 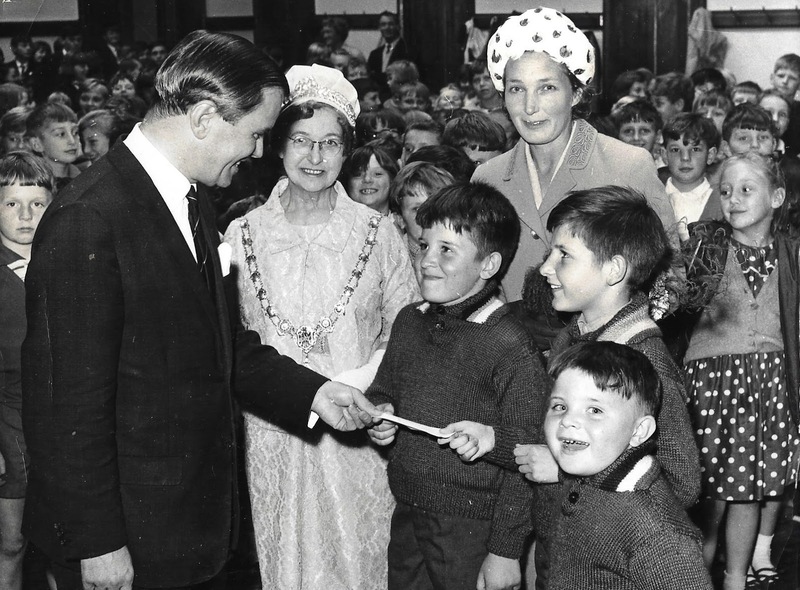 As a result, the chairman of Silsden Urban District Council, Sister Catherine Herbert, pictured second from left, was moved to choose the Research Fund for her civic appeal during her year in office. The target of £500 was handsomely exceeded. Andrew and Freddie had contributed to the appeal by selling dishcloths they had made. The family lived in Dene Grove. 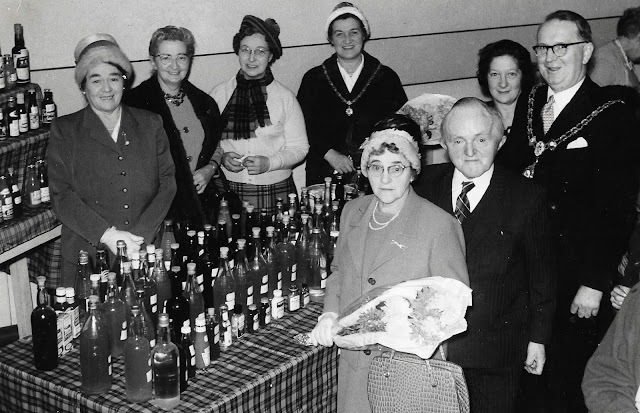 About 1960: Mr and Mrs Laurie Driver (right foreground) are pictured opening a sale of work by the Women's Section of the British Legion. A lot of work obviously had gone into home-brewing, which was a popular activity in local households, making use of fruits and berries grown on allotments and in hedgerows. Manufacturing under the trade name Meddocream, Laurie Driver's ice-cream factory in Hainsworth Road and warehouse in St John Street, were widely known as were the firm's milk bars in Kirkgate (where the Chinese takeaway shop is now) and Keighley. Councillor J. J. Barker, the chairman of Silsden Urban District Council, is pictured on the right with Mrs Barker opposite him. 1970/71: VIPs at Silsden Conservative Association's annual dinner at the Town Hall. The guest speaker was Yorkshire Television presenter and journalist Austin Mitchell (third from left), who went on to become Labour MP for Grimsby from 1977 until 2015. On the left is Keighley Tory MP Joan Hall. Next to her is Conservative Club president Jim Kirk, who was managing director of textile manufacturers Herbert Green and Green and Kirk. Mrs Edith Kirk is fourth from left and next to her are Councillor William Cathey, chairman of Silsden Urban District Council, and Mrs Mary Cathey. All three photographs in this series are from the late Neil Cathey's collection.